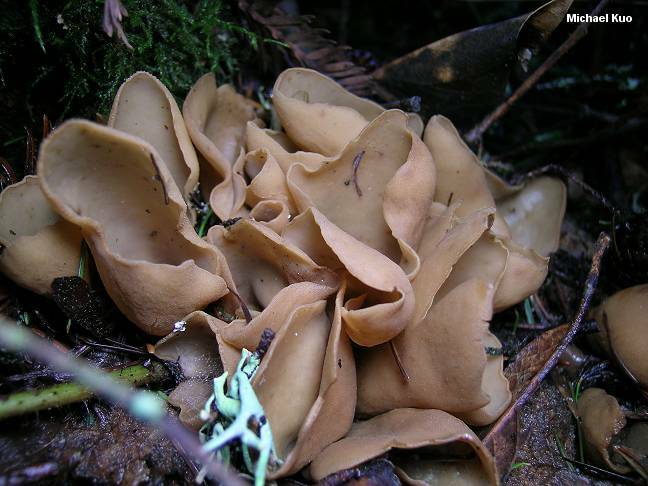 "Otidea leporina" is interpreted somewhat differently by mushroom authors, but most descriptions agree that it is a pale brownish or yellowish brown species that often takes on the appearance of rabbit ears emerging from the ground; the mushrooms stand more or less erect, with the edges folded inward along a central, vertical axis. Microscopic features (see below) help separate Otidea leporina from look-alikes. The illustrated collection, from California, represents Otidea leporina var. minor, which has smaller spores than the typical variety but is otherwise indistinguishable. Ecology: Saprobic, growing terrestrially in woods under hardwoods or conifers; often clustered, but occasionally growing alone or scattered; summer and fall (winter and spring in warmer areas); widely distributed in North America. Fruiting Body: Rabbit-ear-shaped, spoon-shaped, or more or less cup-shaped, with a cleft down one side; up to 7 cm high and 4 cm across; inner surface pale brownish to yellowish brown; outer surface similarly colored or paler, very finely hairy; stem if present whitish, small, and rudimentary; odor not distinctive or fragrant; flesh brittle. Microscopic Features: Spores 12-14 x 6-8 µ (8-11 x 5-6 in var. minor); smooth; elliptical; with two oil droplets. Asci eight-spored; up to 170 x 12 µ. Paraphyses narrow, with hooked or curved ends (see illustration). REFERENCES: (Batsch, 1783) Fuckel, 1869/70. (Kanouse, 1949; Smith, Smith & Weber, 1981; States, 1990; Lincoff, 1992; Barron, 1999.) Herb. Kuo 01120602. Kuo, M. (2006, April). Otidea leporina. Retrieved from the MushroomExpert.Com Web site: http://www.mushroomexpert.com/otidea_leporina.html.